A view of the Roman Forum, 30 feet below current street level. Wander through your own city streets and imagine what you’d find if you stopped at any corner and started digging: tree roots, a toy, some nails, broken plumbing, an arrowhead, or some plant fossils perhaps? Well, imagine having the remnants of one of the mightiest empires the world has every known not only unearthed 30 feet below current street level but in plain sight around every corner, down the length of entire streets, as well as on display in your city’s museums. That’s Rome. It’s a lasagna of history and culture, and there’s no place like it in the world. Picture a million people clustered in a teeming city whose very name came to mean civilization itself. It was the center of economic, political, and cultural world and survived despite war, famine, plague, and even the downfall of an empire. And although this city has never been completely abandoned in its 2700 year history, its demise reduced the to population to 20,000. It was a remnant of a once-great people, lost in the dark ages and covered by the sand of centuries. It became a muse for Romantic Era painters and poets, who conjured up dreamy images and inspired Grand Tour travelers to re-discover this wonder of antiquity. The city was excavated in bits and pieces. And while much of ancient Rome still lies beneath the earth, much as been recovered and beckons all of us to remember the most influential society that shaped the Western World. The Romantic Era painters remember Roman like this, a scene similar to what Michelangelo would have known 200 years earlier. Layer upon layer of ancient temples, seats of government, historic roads, political propaganda masquerading as art and architecture, and civic infrastructure that were neglected for so long after the fall of the Roman Empire have been uncovered only in modern times. It’s easy to take for granted that these 2000-year-old relics are now so easily accessible. But in Michelangelo’s time, the Roman Forum was buried in dirt and debris deposited by a thousand years of Tiber River floods and silt. Only the sturdiest and most massive structures remained, as if struggling not to be buried. Here and there, the arm of a statue or the fragment of a temple pediment might stick out of the grass that blanketed the silt fields, with only cows and peasants for company. Rome is a like a big game of time-tunnel show-n-tell. 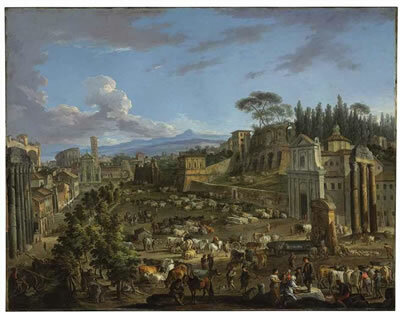 Take a stroll or passeggiata through the city and you can transport yourself to ancient, Renaissance, or Baroque times. And while sightseeing lets you check Rome off of your to-do list, it’s all the more exciting–and valuable for an engaged traveler–to understand the historical context and to get into the mindset of the times. When you’re at the Colosseum, try to imagine what it would have been like to be a part of the experience 2000 years ago. At the Colosseum, you can be the professional gladiator–showered with fame, fortune, and the hope of freedom if you survive your four fights a year. Or be a spectator wowed by the bread and circuses policies of your lunatic emperor–escape from your troubles at home, gorge yourself on the free food and wine, and be thrilled by the first lion you’ve ever seen in your life. Or be the emperor himself–placating all of your citizens and slaves to distract them from their problems, letting them vent their angers in a group catharsis aimed at an unworthy opponent instead of at you, controlling the masses with mindless, violent entertainment. 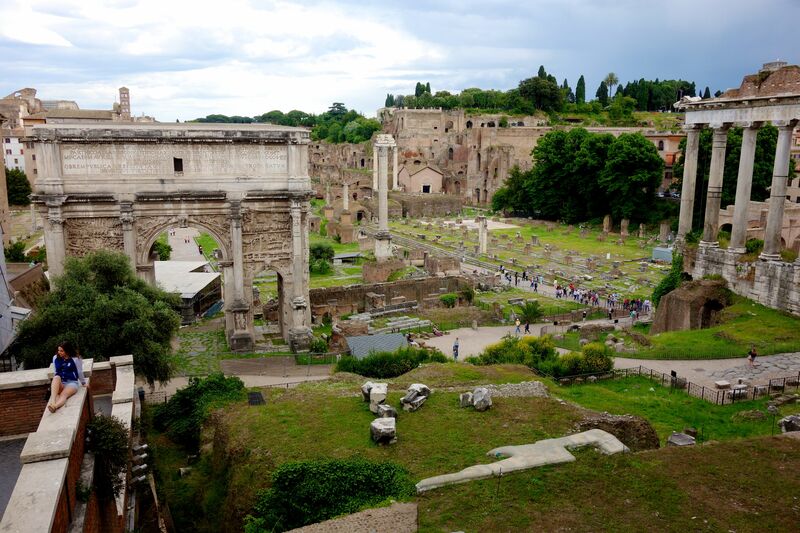 Think of all the history that has happened in just this stretch of the Roman Forum. 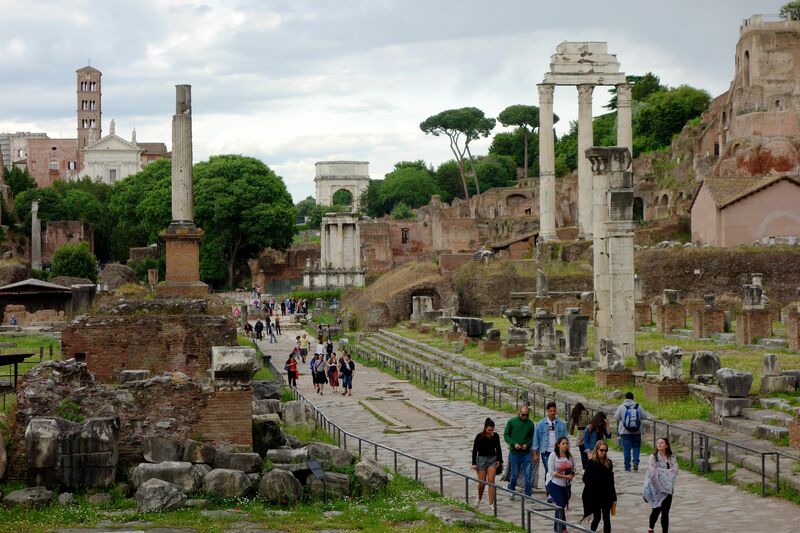 Walk through the Forum, smell ancient vapors of incense as you pass the Temple of Vesta. Hear Roman citizens in the market, discussing politics, mourning the death of Julius Caesar, and cheering the empire’s latest victory. Or be a Roman statue and think of all the history that you would have witnessed. 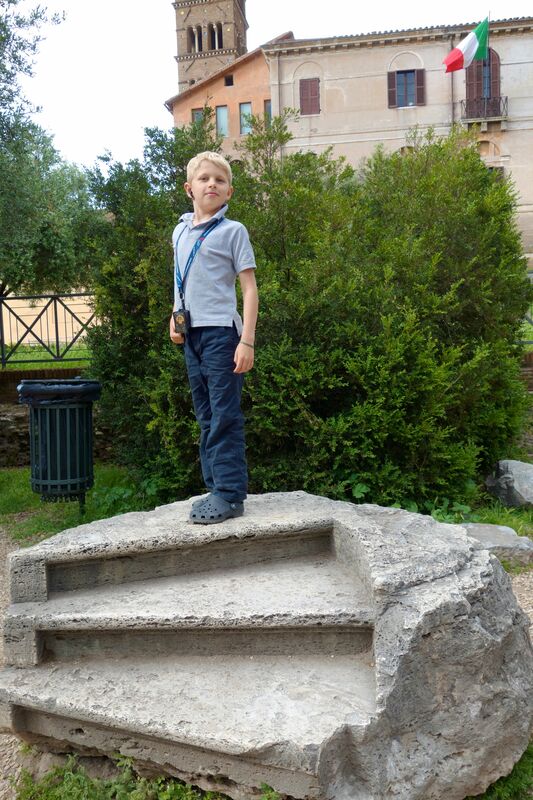 Our youngest tour member, Brogan, stands proud as a Roman statue in the Forum. 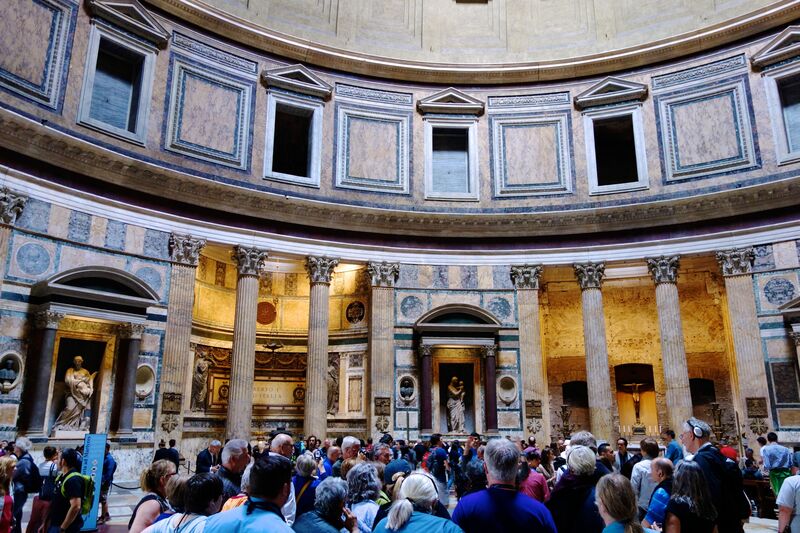 Inside the Pantheon, people admire the architectural wonder above and all around them. Enter the Pantheon, and remember that this church used to be a temple for all gods. Appreciate the pragmatism of the Romans, who embraced all religions of conquered societies to facilitate easier assimilation. Crane your neck across the dome that spans 140 feet and remind yourself that that kind of engineering was not duplicated for another 1400 years and influenced Brunelleschi’s dome in Florence, Michelangelo’s dome of St. Peter’s Basilica, and even the U.S. Capitol Building. And all that colored marble you see? 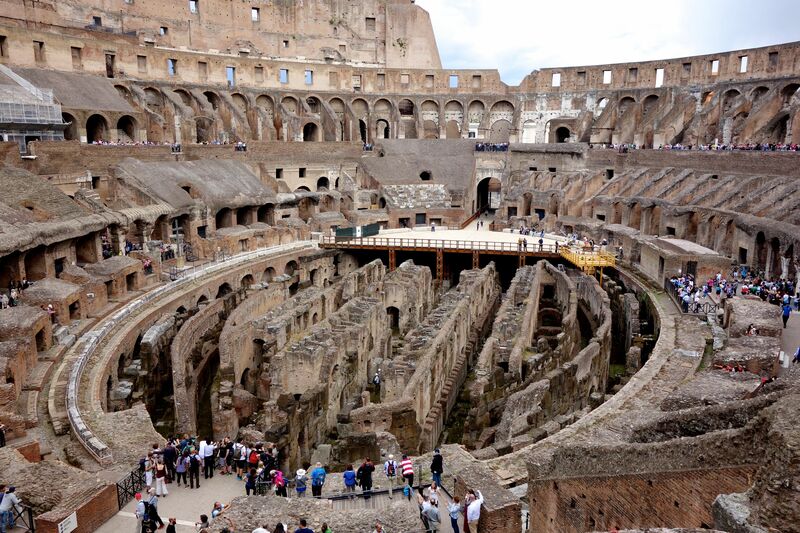 Chalk that up to Roman “recycling.” Those pieces were scavenged from the Colosseum and the Forum. You could explore Rome this way for days and still only experience a fraction of this city’s unique and storied past. You need to experience the many layers of the Eternal City to get a fuller picture of what this unique city is all about. You’ll find it seasoned with crusty neighborhoods, well-aged monuments, robust museums, classic ruins, sweet parks, and spicy people-filled piazzas. And as you’ll certainly find, Rome is much more than one serving–you could never enjoy it all in one sitting. But even just a taste of it leaves you hungry for more.